Established and emerging technologies have changed the commercial real estate landscape. With more and more consumers discovering potential properties online, it is necessary for commercial real estate professionals to adapt to new technology. Understanding the tech that is on the market today can provide a hefty advantage to savvy professionals. This is not an exhaustive list; rather, this is an overview of some of the most popular and useful technologies on the market today. The Internet of Things (IoT) is the process of connecting commonplace items to the Internet, and controlling them through computer programming and apps. Essentially, the IoT is creating smart automation in a home or office environment. The IoT is designed to streamline your day-to-day routine. With the advent of virtual assistants like Amazon’s Alexa and Google Home, the IoT is becoming streamlined through the assistance of AI. For commercial real estate, it is becoming popular to use the IoT to automate and improve the efficiency of many common devices, including lights, thermostats, heating systems, and air conditioning. These devices can be controlled remotely, allowing a property manager to observe their property even if they are off-site. Additionally, the IoT can be used to observe plumbing and electric systems throughout a building, allowing property managers to predict future wear and tear. These smart devices can observe and record data, helping improve energy efficiency and providing a maximal level of user comfort. In commercial real estate, the IoT sensor technology is projected to grow at a rate of 78.8% by 2020. This technology can boost the efficiency of management software. Using the IoT, building maintenance can be improved and energy costs can be reduced by up to 30%. In automating a building through the IoT, a property can reduce its energy output while remaining cost-effective. Drones are small unmanned aircraft that can be controlled with a remote, allowing a user to record video or take photos of scenery. 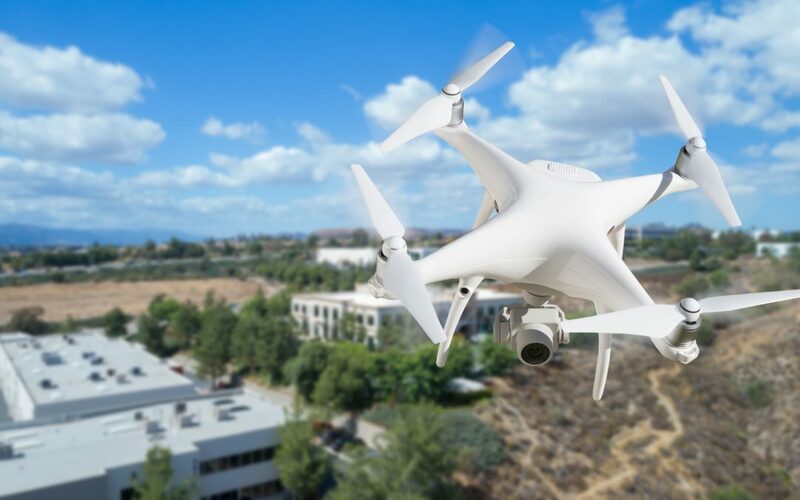 Drones have been growing in popularity in commercial real estate because they can take professional images of commercial properties with ease. The Federal Aviation Administration (FAA) predicts that by 2020, 22% of all commercial drones will be used in real estate photography. Never before has it been so cost efficient to record stunning aerial photos of commercial properties, allowing for the creation and publication of high-quality marketing materials. Not only can drones be used to take images or videos for marketing purposes, but also they can be used to conduct maintenance inspections in traditionally hard-to-reach areas. Drones can be used to observe crawl spaces, a building’s roof, external piping, and other parts of a building’s exterior. Additionally, drones can examine a property for damage, such as flooding or icy conditions. Drones can swiftly observe large swaths of land, significantly cutting down the time a property manager needs to spend inspecting their commercial real estate property. In order to legally fly a drone for commercial use, however, it is necessary to understand the FAA’s drone guidelines. Be sure to take the time to understand when and how a drone can be utilized. Legally operating a drone can improve the management and maintenance of a property, while also providing beautiful marketing materials. The Internet has seen the rise of commercial real estate marketplace websites such as Zillow, LoopNet, and Trulia. These sites allow potential clients to shop for properties from the comfort of their own homes. Therefore, conducting research on how your clients find your properties is essential. Learning which sites they rely on can help you better focus your marketing strategies. Investing in traditional print marketing will no longer have the same impact on your business: remaining active on the right apps and websites can ensure that your properties are viewed by potential clients. It is necessary to not only be present on digital marketplaces, but to also provide other avenues for clients to stay in contact with your business. Digital newsletter marketing strategies are taking off in the commercial real estate industry. With subscription-based newsletter-building sites such as ConstantContact and MailChimp, it is possible to create professional digital newsletters and fliers without having design experience. These sites also offer data analytics on when and how clients receive your newsletter. You can learn the best day and time to send your campaign, understand what content receives the most clicks, and track your return on investment. Commercial real estate professionals need to stay on top of digital marketing trends in order to remain competitive. Commercial real estate businesses that rely heavily on tablets may want to re-think their technological business structure. For a number of years, tablets ruled as the primary tool for professionals across many industries. However, as smartphone screen sizes have gotten bigger over time, tablet sales have been on the decline. In the second quarter of 2018, tablet sales were down 13.5%. Even though smartphone screens are larger, smartphones are lighter and less cumbersome to use. Millennial professionals may view tablet-heavy businesses as being technologically out-of-touch. It is important to note that millennials are established working professionals. Aged between 24 and 38 years old, millennials are the largest generation in America’s workforce. Commercial real estate professionals must be prepared to work with the expectations of millennial clients. With more young professionals opting to work remotely or on-the-go, many clients expect to conduct business during typical business hours. In order to demonstrate to potential millennial clients that your business can meet their standards, focus on smartphone efficiency with any of your websites, social media, or marketing strategies. Customer Relationship Management software (CRM), allows a business to organize schedules, plan deals, and record interactions with prospective and returning customers. There is a large variety of CRM software packages. Some focus on integrating social networking with your business’ marketing plan, while others provide an all-in-one platform where you can track leases, properties, and deals. With CRM software, a commercial real estate business broker can gather valuable data on market trends and customer preferences. CRM software also allows you to keep notes on your clients, allowing you to remember valuable information and improve your business-customer relationship. For every dollar that a commercial real estate business spends on CRM software, they receive an average of $8.71 in return. Because CRM software are almost always cloud-based, there is no need to retain physical files. CRM software allows a business to go nearly paperless, creating the opportunity for a business to embrace green initiatives while also saving money. Additionally, many CRM software services have mobile apps, allowing brokers and other commercial real estate personnel to access important data on-the-go. While CRM software are one form of data analytics, there are many other kinds of software that can help professionals in the commercial real estate industry. Building management systems (BMS) are software that use sensors and data analytics to improve a building’s energy performance. Data analytics allows commercial real estate professionals to make educated decisions for specific properties based on data sets unique to your business. These analytics can track everything from local census information to habits of your clients. CRM software and BMS software can be worth the investment. There are a variety of commercial real estate-specific CRM programs to choose from. Take the time to research the best product for your business. Many data analytics and CRM software rely on cloud storage to record and save files. Cloud computing is very different from a typical desktop computer. A desktop computer stores all data and programs in its hardware, which is located in local storage. With cloud computing, the storage is not attached to dedicated hardware; rather, cloud computing occurs over the Internet. This means that files saved to the cloud can be accessed independently from a single computer or device. Some common cloud storage systems include Apple’s iCloud, Google Drive, and Dropbox. For commercial real estate, there are business-specific cloud computing solutions. Most CRM software are cloud-based, as are many BMS systems. Moving your business to a cloud-based file system not only allows you to work outside of your office, but also it saves on paper. Removing the need to maintain paper files can reduce your budget and free up physical office space. Additionally, cloud-based systems often offer data analytics and dedicated note-keeping services. Moving your business to the cloud can reduce your carbon imprint, impress and attract younger clients to your business, and allow you to access property and client information from anywhere at any time. Technology is changing how Americans approach their daily work life. This, in turn, is adjusting consumer expectations of the commercial real estate industry. As the IoT establishes itself in commercial appliances and utilities, building management has never been easier. Commercial real estate professionals must adjust to new marketing strategies and software. With new innovations in online software, it is becoming more affordable to shift to cloud-based and mobile business practices. Successful commercial real estate businesses are following the latest tech trends closely, and they are adjusting their marketing plans, business structures, and management practices accordingly.